Having grown up along the shores of Lake Michigan and been educated in Illinois, Ohio and Minnesota, I have always been a fresh water adherent, even after eight years of breathing Miami's salty air. As they like to say in Michigan, their water is “Unsalted and Shark Free.” I’d been away from the Great Lakes for more than four decades, so when the opportunity arose for a two-week excursion around Lake Superior and a return to the rushing rivers and waterfalls of my youth, I knew it would bring back a lot of memories. Cynny and I were in Milwaukee in mid-July to visit my brother and pick up my mom for our third annual Wisconsin road trip. Since she turned 90, we’ve backed off from taking her on ancestral tours of Hungary and the surrounding region, although she would happily still go. After dropping her back in Milwaukee and giving a presentation on wildlife photography at her retirement community, we headed up to Silver City, MI where we started our circumnavigation (minus 64 miles). Unfortunately, Cynny was nursing a newly broken collarbone, so our adventures were restrained. Our journey began in mid-July, the same day a heat dome reached the Great Lakes States. In fact, when we arrived at our lodge late in the afternoon, there was no power due to a tornado that had passed nearby a day earlier. The power was restored by nightfall, but the heat continued for the next ten days. Needless to say, my long-sleeved shirts stayed in the bottom of my pack and we spent more time than planned washing our limited summer wardrobes in local laundromats. It’s impossible to escape climate change anymore, even in the north woods. Our route was planned to facilitate hiking to many of the impressive waterfalls along the lake, photographing clear night skies and visiting interesting historical, cultural and roadside landmarks and a few lighthouses. As with all such trips, we left a lot unseen and late summer is not the most interesting time to photograph the region. I’m looking forward to returning to see the sites in the full glory of fall color and then again to photograph some favorite waterfalls frozen into solid ice. Our first stop on the way north was Horicon Marsh, the largest freshwater cattail marsh in the country. The Marsh is a major feeding area during spring and fall migrations for many species of ducks and geese and a breeding ground for numerous colonial wading birds. Numerous management issues have affected bird populations during the history of both the state and national wildlife refuges. 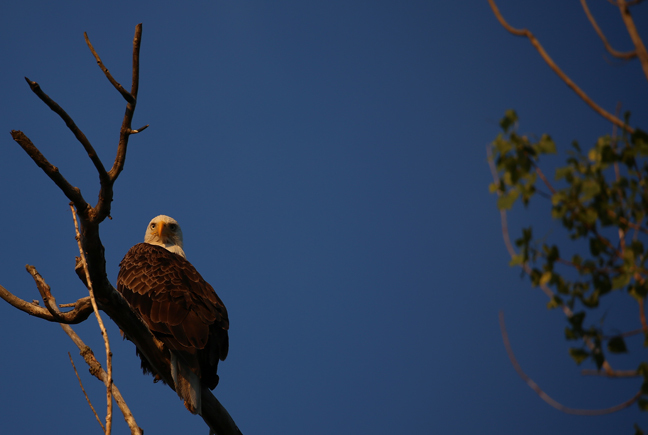 During the summer, the main attraction is a breeding pair of bald eagles. Unfortunately, their nest, in a dead tree, was lost in a storm earlier this year and it is unknown whether they will continue to breed in the refuge. Another stop on our way north was High Cliff State Park, outside of Appleton, WI. The Park is 16.5 miles north of Brothertown, WI where I attended the Chicago White Sox Boy’s Camp on the shores of Lake Winnebago as a young teen in the 1960s. The Butterfly Pond Trail is a short accessible trail near the Park gate, perfect for Cynny with her sling and mom with her walker. Manido Falls is one of three Presque Isle River waterfalls along the boardwalk trail within the Porcupine Mountains State Park in Gogebic County, near the western end of the Upper Peninsula of Michigan. It is between the larger Manabezho and Nawadaha Falls. The name Manido comes from the Ojibway word for spirit or ghost. The Split Rock Light Station was put into service in 1910 after a 1905 November gale blew numerous ships into the rocky coastline. 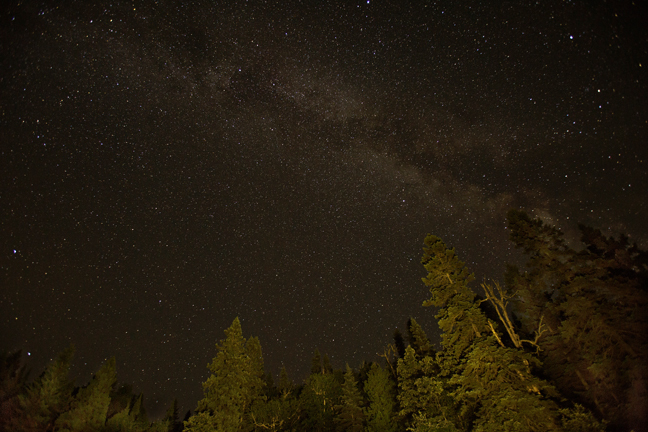 For the next 60 years the light flashed at 10-second intervals illuminating more than 20 miles of Lake Superior. Today, it only shines each year on November 10 to commemorate the sinking of the Edmund Fitzgerald. 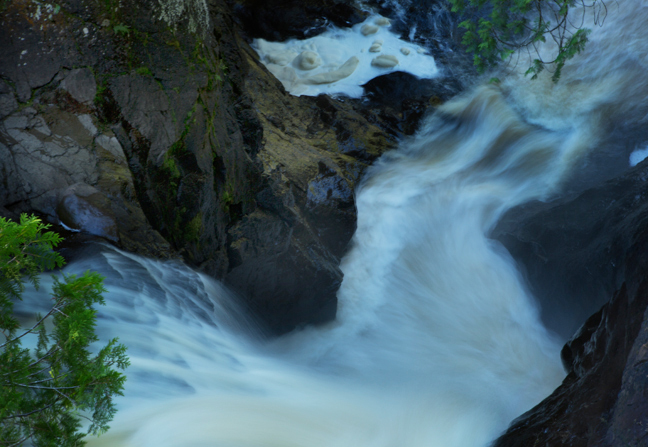 The Cascades of the 8.8-mile-long Baptism River drop 12 feet into a calm pool over a rocky outcropping at the end of a two mile trail from the visitor's center in Tettegouche State Park. 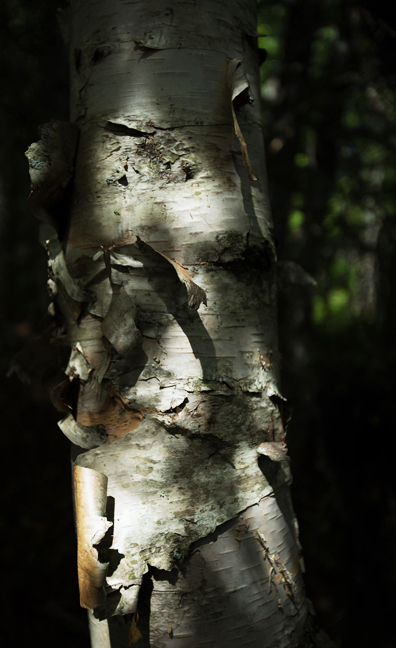 A paper birch tree in morning light in Tettegouche State Park. The coastal paper birch-aspen forests are replaced by maple, yellow birch, basswood, white spruce and red oak as you move away from the lake. 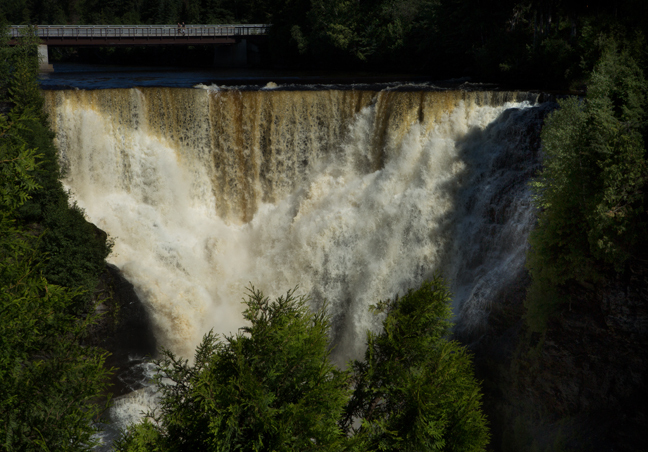 The 70-foot High Falls of the Baptism River is the highest waterfall entirely within the state of Minnesota, although not higher than the High Falls of the Pigeon River that share its falls with Ontario. 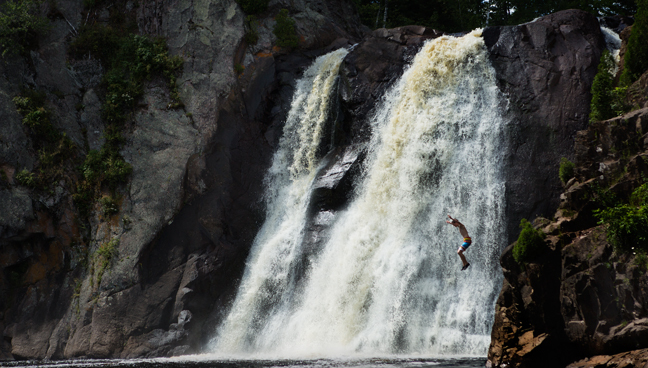 The falls are located within Tettegouche State Park. Tettegouche Camp, the renovated remains of four hike-in cabins built a century ago for the Canadian Alger-Smith Lumber Co, is on the National Register of Historic Places. 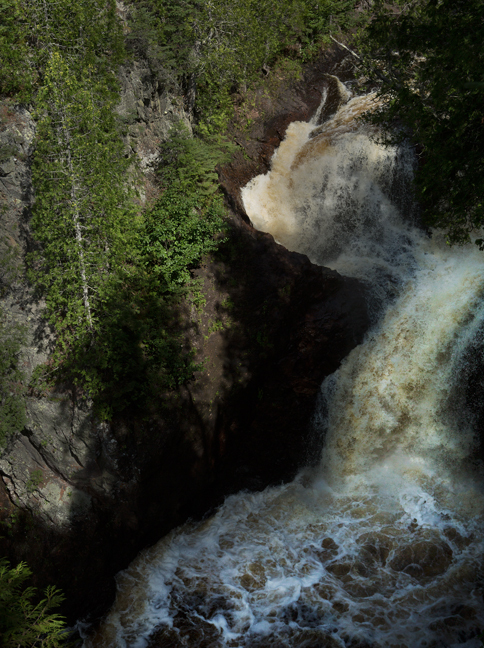 The Cascade River in Cascade River State Park, between Lutsen and Grand Marais, MN cascades down a series of volcanic ledges dropping more than 900 feet over three miles before emptying into Lake Superior. The Civilian Conservation Corps developed the park, originally named the Cascade River State Wayside, beginning in 1934. 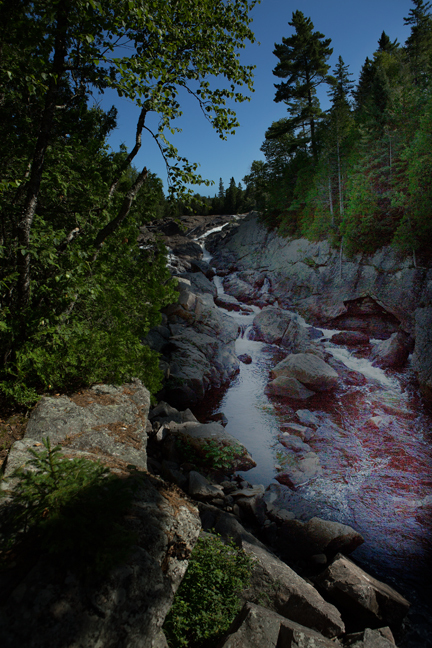 Located in Judge C. R. Magney State Park northeast of Grand Marais, Minnesota. 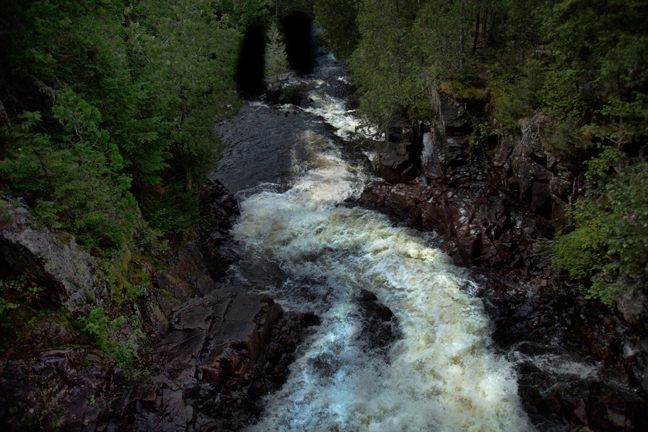 The Brule River drops 800 feet along an eight-mile stretch and forks at a rocky outcropping about a mile and a half north of Lake Superior at Devil’s Kettle, a giant pothole. Most of that drop is paralleled by a beautiful trail through a birch and aspen forest that features about 200 wooden steps. To the east, the river continues on, but to the west it disappears. Scientists (and others) have poured dye, a variety of small objects and even logs into the Kettle hoping to see them emerge, but so far, no one has found their destination. It is likely somewhere beneath Lake Superior. Directly across the road from the Judge C. R. Magney State Park entrance is the historic Naniboujou Lodge and Restaurant, the remains of a planned resort community built by wealthy businessmen from Duluth as a private club in the late 1920s that listed Babe Ruth, Jack Dempsey and Ring Lardner as members. The Great Depression led to foreclosure in 1935, but the lodge, on the National Register of Historic Places, remains and includes a hotel and restaurant. 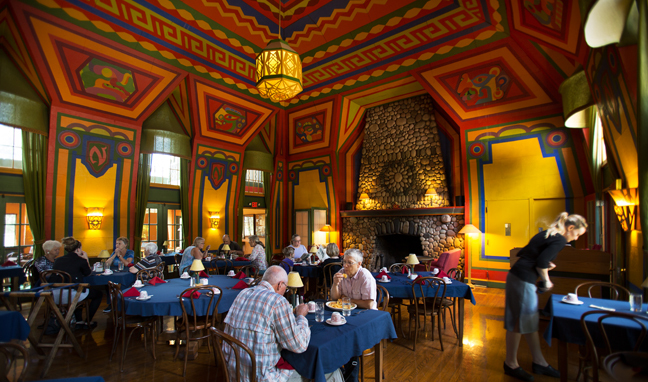 Antoine Goufee painted the restaurant’s walls and ceiling with interpretive traditional Cree patterns. The dining room also features a 12-foot tall, 180- ton native rock fireplace. The hotel is not air-conditioned and does not have an elevator, so you have to value culture over comfort if you choose to stay during an oppressive heat spell (as we did). However, the restaurant is excellent. 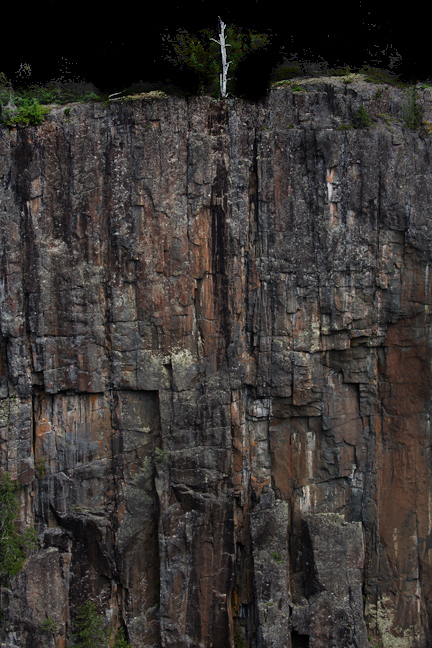 Ouimet Canyon Provincial Park features a 1.9-mile long, 330-foot deep, 500-foot wide gorge northeast of Thunder Bay, Ontario. Joseph-Aldric Ouimet was the Canadian Minister of Public Works from 1892-1896 and the Ouimet Station for the Canadian Pacific Railway was located nearby. In the afternoon light, a lone paper birch stands out against a backdrop of conifers. The Rainbow Falls Trail located within the park is part of the 32.5 mile Casque Isles Trail section of the Voyageur Trail that runs between the communities of Terrace Bay, Schreiber and Rossport. 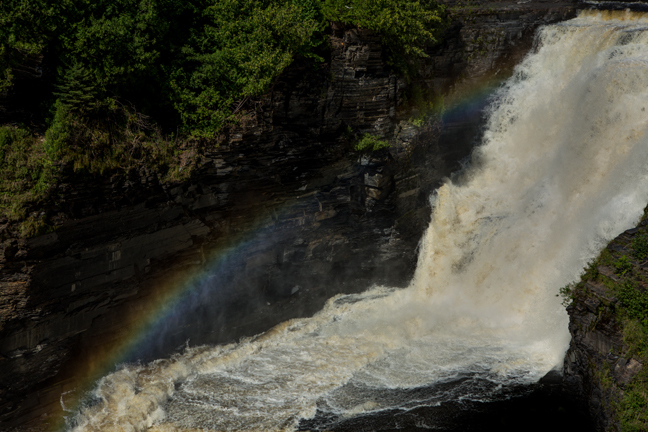 The Falls of the Whitesand River are a cascading series of drops totaling more than 100 feet within the Rainbow Falls Provincial Park. I decided to photograph the High Falls of the Magpie River at night under the Milky Way. Unfortunately, there was little information available about the flow of this dam-controlled falls. 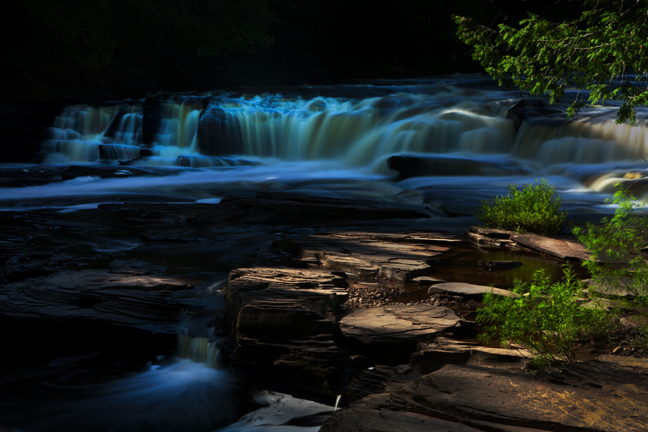 When visiting during the day to scout the site, it seemed feasible as the falls were impressive and there was easy access to the bottom of the falls close enough to allow for effective lighting. When I returned around midnight, the only thing missing was water. 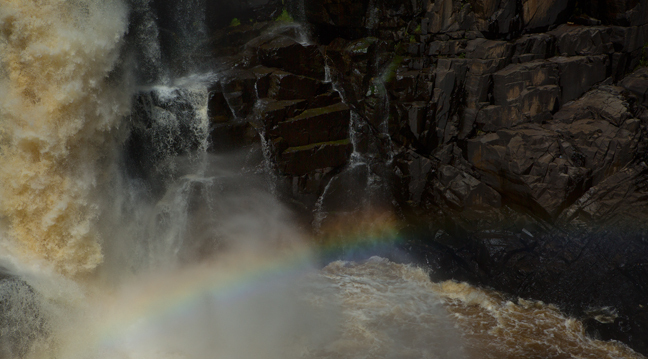 The massive falls was only a trickle. I guess the people of Wawa don't need much electricity in the middle of the night. Since I came prepared to light a waterfall, it was relatively easy to simply turn around and light the beautiful coniferous forest behind the falls. The Golden Mantled Ground Squirrel eats seeds, nuts and fruits and is found from southeast British Columbia to northern New Mexico and southern California. It is easily confused with the Least Chipmunk as their ranges overlap, but chipmunks have body and head stripes and ground squirrels just have body stripes. Tree Squirrels are larger and have no stripes. The story is that when the last bit of the Trans-Canada highway, linking Wawa to Sault Ste. Marie and Western Canada, was completed in 1960 the townspeople were dismayed that it by-passed the business district of Wawa. Local entrepreneur, Al Turcott, proprietor of Turcott’s Dry Goods & Clothing Store, opened in 1944, decided that they needed an attraction to get people off the highway and into downtown. 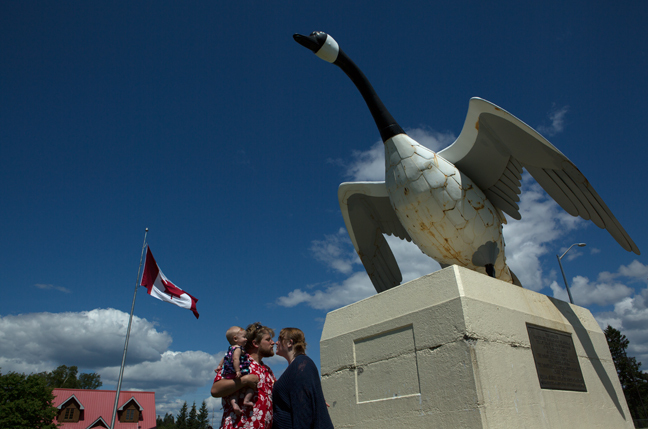 Wawa means wild goose or land of the big goose in Ojibway, thus the largest Canada Goose monument in the country sits near the junction of the Trans-Canada Highway and Canada Highway 101 in downtown Wawa. The original plaster statue was replaced by the current steel one in 1963, but significant deterioration has forced the launch of a fund-raising drive for a new goose. You can contribute at www.thewawagoose.com. 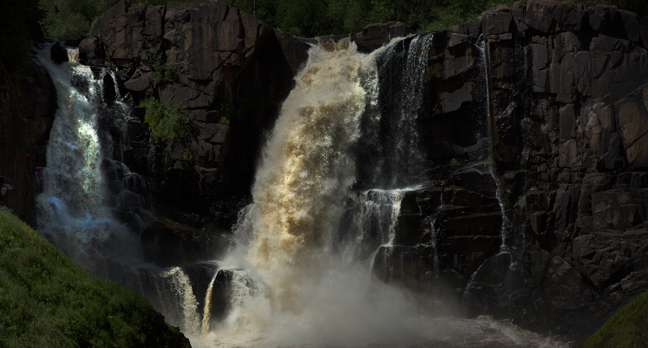 This series of cascading falls is located in Lake Superior Provincial Park along the Pinguisibi Trail. Pinguisibi is the Ojibwa name for the Sand River. The River was used by the Ojibwa for at least 2,000 years for travel between their inland winter camp and their summer camp on the Superior shore. There are numerous swimming spots between the cascades along the river. The Park covers more than 600 square miles between Sault Ste. Marie and Wawa along the Trans-Canada Highway. 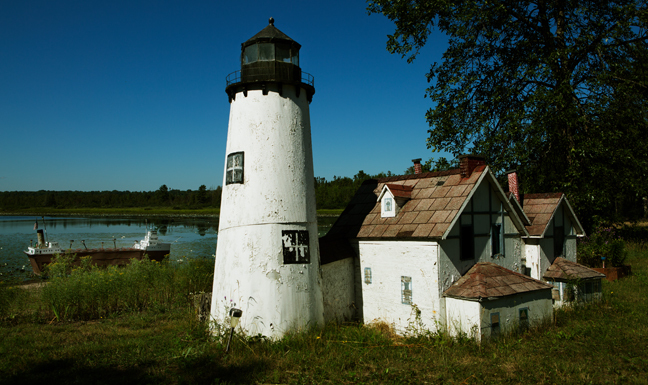 On the south side of W. Lakeshore Drive, 15 miles west of exit 386 on I-75 and directly across the street from The Old Indian Burial Ground are miniature replicas of an Ore Freighter and the Point Iroquois Light Station. They're 2.6 miles from the actual Light Station. The Station and Lighthouse were closed the day we drove by so we didn’t have to climb its 72 steps. Point Iroquois is at the transition between Whitefish Bay and St. Marys River. In 1662, Ojibwa Indians discovered invading Iroquois camped at the point and wiped them out, halting the westward advance of the Iroquois. The point was subsequently known by Native Americans as Nadouenigoning, or place of Iroquois bones. Geezis, the great Sun, behold me!" 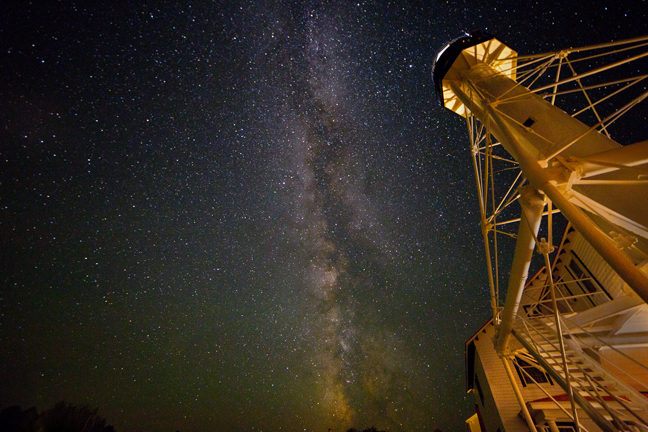 The Whitefish Point Light Tower in Paradise, MI, seen here under the Milky Way, is the oldest operating lighthouse on Lake Superior and has been in continuous operation since 1861. 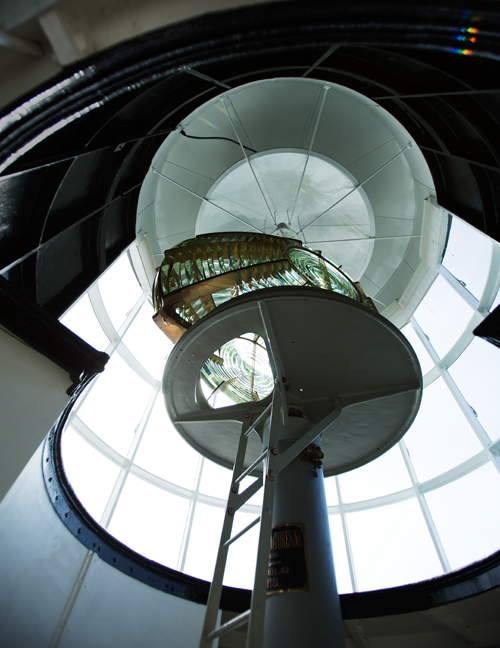 The Whitefish Point Light Station is on the National Register of Historic Places and also houses the Great Lakes Shipwreck Museum. The Station features the Crew Quarters Overnight Program that allows guests to stay in the restored U.S. Coast Guard barracks building, originally constructed in 1923.